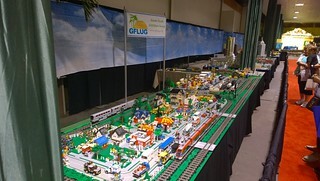 While most people in Florida take to the beach for Labor Day Weekend, the Greater Florida LEGO® Users Group was busy displaying at Florida's Largest Home show. Todd, Mark, Robin, David, Katie and myself worked most of the day on Wednesday, to setup the roughly 15' x 80' display in the Expo Hall at the Florida State Fairgrounds. The Expo Hall is a much different atmosphere than the Special Events center of which we are so accustomed. The tricky part of the setup was building the layout around 4 pillars that were spaced evenly throughout our display area. Thursday morning, David returned to finish detailing his area and was interviewed by Charlie Belcher from the FOX 13 Good Day Morning Show. Charlie got a big kick out of the LEGO® sig-fig David made of Charlie, complete with coffee cup, microphone and remote film crew. All weekend long people kept asking "Where's (LEGO®) Charlie?" The display consisted of Tampa in the middle; David's housing area and Robin's new industrial area off to the left of Tampa, and a yard on the right side of Tampa. Mark brought his Ford Hotrod and set it next to a monorail loop to help promote the Transportation theme, which the Home show wanted us to focus on. David showed off his new A-B-A set of Santa Fe Blue Bonnet F-Units which ran for a good part of the show. Mark also brought his New Jersey Transit passenger train equipment, which is part of his project for Brickfair New Jersey! Overall, it was a nice display and definitely different from the standard walk-around rectangle we typically do. Friday, Saturday, Sunday and Monday were all pretty similar with an overall public attendance of around 42,800 for the show weekend. 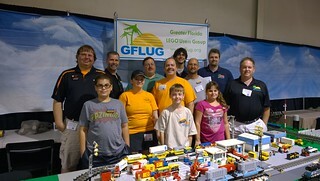 In between operating the layout, promoting the Brickworld Tampa event, the December Train Show, and answering general questions, members got in a few breaks to go tour the rest of the Home show. We even found time to go race a few laps on the indoor Go Kart track at the show! At the end of the long four day show weekend, we packed up Monday night in about 3 hours. Special thanks to all the extra club members for coming out and helping with takedown. 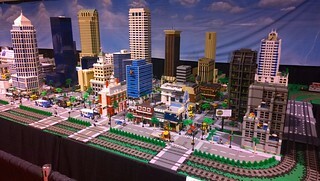 Looking ahead, we can now focus on our preparations for the Brickworld Tampa event in October!